Luxurious Private Bungalows amid the Sea and the Sunny Sky. The private Bungalows of the Angel Bay Complex lie on a small hill in front of a sunny beach, making it the perfect destination for a relaxing getaway for the body and mind. With the privilege of having its own private sand beach, taking a swim is a matter of just walking out the door. Due to its unique location, a stay at Angel Bay Complex is ideal for visitors who prefer to enjoy their vacation within nature, but would also like to experience the magic of the ancient city of Thessaloniki, just 35 minutes away. Within 5 minutes by car, one could reach the nearest villages, Perea and Michaniona, which offer everything one could want. Many restaurants, beach bars and night clubs of the region are easy and quick to access either by car or by bus. We recommend the small ferryboat trip (www.karavakia.com) which leaves from Nei Epivates or Perea, crosses the golf of Thessaloniki and arrives just at the heart of the city. Angelbay has 6 Bungalows, each fully equipped and uniquely decorated. 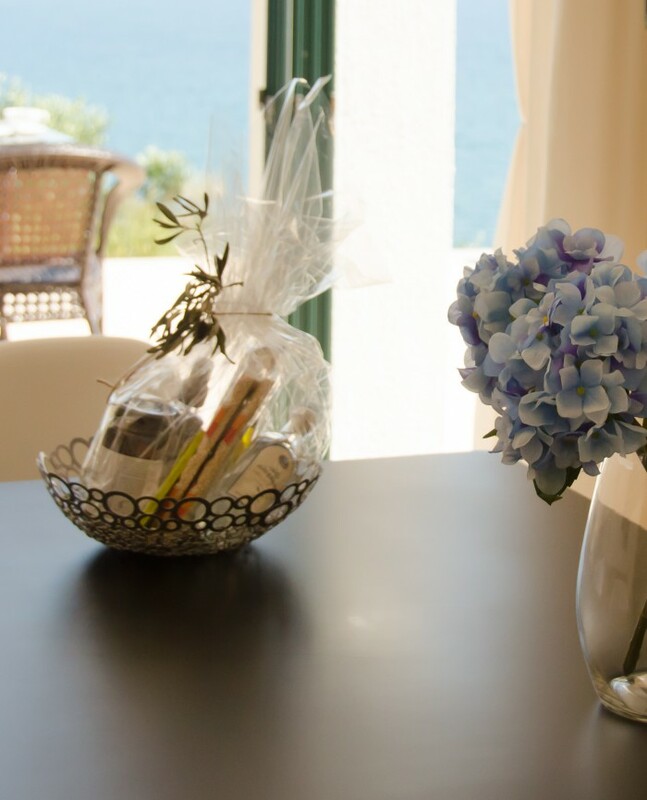 The Olive Tree, Helios, Seagull and Starfish Bungalows have their own private terrace, offering an astonishing view of the entire gulf of Thessaloniki.The Shellfish and Dolphin Bungalows with their own balcony, offering a wonderful view to the swimming pool and also partial sea view. The Bungalows are surrounded by an 8.000 square meter large garden, a swimming pool and a special arranged barbecue in order to ensure a pleasant stay. Guests are able to shake off the stress by visiting the nearest (5 minutes on foot) Tennis Club or by taking beautiful bike rides along the beach. Many water sport activities are offered, such as kite-surfing, Sup, Canoe or wind-surfing, available at the nearby beach bars. Fishing fans are welcome to practice their techniques by using either their own or the Complexes’ fishing equipment. Feel at home by using our facilities, sharing your dream vacations with your loved ones. An incredibly beautiful place, very helpful staff, lovely very well maintained private beach, drinking views. I highly recommend this for either a chilled out or romantic holiday. It's a beautiful place with an amazing panoramic view of the sea.The host is very friendly and helpful, I will certainly come back here! 2 weeks of complete tranquility and bliss here. Luxurious surroundings. Great hospitality from George & team. Couldn't fault it. If your ever in this neck of the woods stay here. You won't regret it!